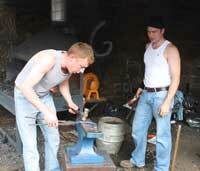 The World Championship Blacksmiths Competition held at the Calgary Stampede will this year take place from 4th to 8th July and will be judged by David Wilson Sr., (Scotland) and Shayne Carter, (USA). The UK is always well represented and has a remarkable record at the Championships and this year should be no exception. Each year excitement builds as individuals form pairs and pairs become teams of four as combinations vie to place themselves in the strongest and most competitive position possible. On the eve of the Ayrshire Branch Competition it was confirmed 'Team Mustad' would be represented by Steven Beane and Derek Gardner coupled with Paul Robinson and David Varini. Each team member secured a Top Ten placing last year and their competitive records speak for themselves..
Reserve World Champion in 2008 and European Champion in 2010, David is a serious competitor who consistently achieves great results. Current World Champion and winner of the title for the last three years Steven is very much looking forward to the competition this year and being a member of ‘Team Mustad’. Twice National Champion and placed in the Top Five at Calgary four out of four times Derek is a highly sought after Judge and Clinician with a successful tool making business. 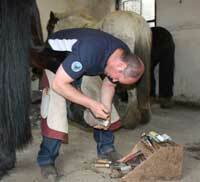 World Champion in 2008, Reserve World Champion in 2011 and winner of the ‘Mustad Champion of Champions Exhibition’, Paul is a meticulous forger and horse shoer who is highly respected by his peers. Each member of ‘Team Mustad’ is supported by a wife/partner, friends and family and we join them in wishing them all the best. Chosen to be the “winning team” and ambassadors of Mustad we will be following their practices and competitions in the next 2 months in the run up to the World Championships. The 'Road to Calgary' will be updated as time progresses and dates are confirmed. 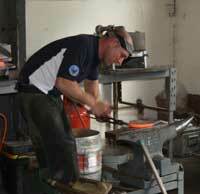 The Ayrshire Branch Shoeing & Shoemaking Competition is possibly the largest in Europe. Over 100 competitiors fought it out over two long days with the newly formed Team Mustad posting scores that the opposition should be concerned about! Each member finished in the Top Five in the Championship. David was crowned Ayrshire Branch Champion with Steven Reserve Champion, Paul finished 3rd overall with Derek 4th. A terrific start! Furthermore in the Two Man Draught class the two pairs Steven and Derek and Paul and David drew for first place with the top spot eventually being awarded to Steven and Derek as the tie-break was decided on the front shoe score. 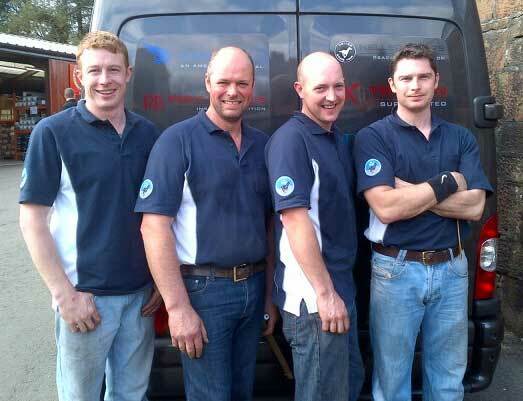 Silverback Chaps were confirmed as suppliers of exclusive, special edition chaps to Team Mustad. These are currently in production and will be presented to the Team to be 'worn in' later in May. Derek and Steven plan to compete. As most of us were enjoying unusually hot, brilliant sunshine in May, Team Mustad were testing their ability to withstand the heat at a team practise in Penrith. An early start for Paul and David and a hot testing day as all team members made errors in both trimming and shoemaking. Time issues were highlighted in both changeovers and efficiency. Plenty to think about before the next practise and a lot to be learnt but that's what practise is for! Team Mustad were extremely proud to be wearing special edition chaps provided by Silverback Chaps. I am sure you will agree the team look great and are currently 'wearing them in' to ensure they are perfect for Calgary. Both Steven and Derek took part in a very wet two day competition at Stafford Show. This is a popular, extremely well run competition highly regarded amongst competitors. Both Steven and Derek posted good results with 'Beanie' on particularly good form and running away with 'The Iceman Trophy' and Show Championship! The Team met on the morning of 9th June at Ruraidh and Margaret Robb's home near Edinburgh to practise the four man shoeing class. Each team member is required to shoe a foot of a draft horse in a total of 120 minutes with a three quarter fullered shoe with hammer drawn front and hind toe clips. Working in pairs the team of four need to rotate between anvil and horse to make the best use of the time they have and ensure everyone in the team is able to complete the task in hand to the best of their ability. David and Paul began by making their shoes first and Steven and Derek began by trimming feet first. Team discussions focused on planning to ensure that at no particular time was a competitor waiting at either anvil or horse. Valuable lessons had been learnt from the previous practise and a new approach to working together had been thought out and planned to ensure those 'teething issues' were resolved. Ruraidh Robb kindly marked the work done to give the Team an impartial opinion on the work completed and following a superb lunch provided by Margaret a second horse was supplied and the practise repeated. A successful day and a vast improvement on the previous four man practise! Special thanks to both Ruraidh and Margaret for making the practise so worthwhile and enjoyable. Paul and David undertook the long journey from Scotland to join both Derek and Steven at the very popular Three Counties Show. A 'last run' for many UK (and some European!) competitors travelling to Calgary this year was a particularly wet one with competitors wading through mud to get to the Forge. A win for David in the Open Therapeutic Shoemaking and wins for both Steven and Derek in the majority of the other 'open' classes in additon to top six placings for all four Team Mustad members in every class meant for a very successful three days. Derek was crowned overall Show Champion with Steven a very close Reserve just 0.3 points away! Competitors at the Three Counties Show also gain by the show allowing access to all individual markings allowing for very close scrunity of an individuals performance - perhaps giving an indication to where those crucial points were lost and gained! With last minute practise underway before final sharpening and polishing of tools, packing of bags and then flights to catch, Calgary is virtually upon us! World Championship Blacksmiths Competition, Calgary Stampede 2012. I, like many others, was glued to the internet, emails, Facebook and UStream for the slightest piece of news or update from the competition. 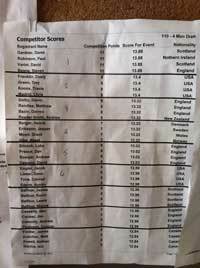 We were at a competition here in the UK and all shared information over the course of the weekend as gradually, bit by bit, we received results from Calgary. In the early classes Steven Beane secured maximum points with a win in the Front Work Horse Shoe which was closely followed by good placings, and further points, in the German Army Shoe, Arab Toe Weight and Concave Shoeing. Derek Gardner and David Varini both picked up valuable points in these early classes too. Aksel Vibe, Henrik Berger, Jesper Eriksson, Grant Moon. Paul Robinson secured a good fifth place in the testing Tong & Salmon Side Weight Shoe, a class which many other competitors failed to finish in. Paul and David took top spot in the Two Man class with Steven and Derek in fourth position. With all of the team accruing valuable points the tension mounted whilst waiting to hear the list of competitors that had secured those hard fought for, valuable Top Ten placings. Late on Saturday night these were confirmed as - Grant Moon, Gene Lieser, Steven Beane, David Varini, Darren Bazin, Derek Gardner, Paul Robinson, Jesper Eriksson, Henrik Berger and Yoann Policard. With all to play for, and the competition still widely open, the first round of shoeing on the Sunday was a real test of strength and ability whilst remaining calm in the electrifying atmosphere. Following a tense wait, those victorious in gaining an elusive place in the Top Five were confirmed as David Varini (Scotland), Grant Moon (UK), Derek Gardner (Scotland), Yohann Policard (France) and Steven Beane (UK). Four members of Team Mustad had made it through! A further round of shoeing, a lot of nail biting and speculating, and the announced was made - World Champion Blacksmith 2012 and Team Mustad member was Steven Beane! In Reserve was Grant Moon (member of Team Heller), 3rd David Varini, 4th Derek Gardner and 5th Yohann Policard. An unbelievably good result. On behalf of Team Mustad, Steven Beane, would like to "thank Mustad for their support throughout the competition. Without sponsors such as Mustad supporting these competitions they would simply not be the success they are today. I am thrilled with the result, it will take a while to sink in..."
To read the official Clagary Stampede Press Release visit here.